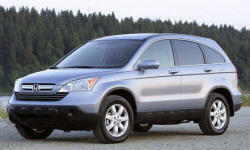 Honda CR-V Powertrain Performance Pros and Cons | Page 1 of 2 | Why Not This Car? What drives people to buy (or not buy) a certain car? 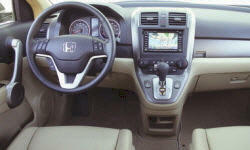 TrueDelta's members share Honda CR-V pros and cons based on their real-world driving experiences. Why not buy the new Mazda CX-5? There aren't many good reasons. Even though the powertrain does not let the engine rev much, it holds the RPMs just right in order to accelerate linearly. You can tell at times there is a CVT under the hood, but otherwise it is unobtrusive. Stepping down from the XT to the 2.5i, you give up 80 horsepower. But, given how the Forester will typically be driven, the non-turbocharged, 170-horsepower engine feels plenty punchy. Over the course of the week I felt the need for more power...zero times. CVT works very smoothly. Merging onto highway takes a heavy foot to get the revs and speed up but the car responds willingly, although feels slightly stretched and the engine wipes the sweat off its brow when merging completed. what a insult to the world's #1 car maker!! I have owned over 20 vehicles in my life and this CRV AWD has plenty of power. It is perfectly balanced for power and efficiency. Compared to the Equinox which we were looking at, it is about 1 second faster from 0-60. Fuel efficient and plenty of power to pass at highway speeds. Engine inspires confidence. Transmission exceptionally smooth. not real awd: google it for videos, and you will see that awd never kicks in when required. a fake awd. and you cannot lock (like in patriot or rav4 for example). Underwhelming soccer mom engine. Felt like it should be in a civic, not an 3500lb SUV. Desire 5 or 6 speed auto for more driving flexibility and at least a little more power. Makes a great 2nd car, town car, commuter, etc. or cheap transportation for a small family or single person. 4 Cyl engine very week for this size and weight vehicle. At its curb weight, and, with 180 HP, performance is quite decent for a 4 cyclinder SUV. It could use a bit more power, especially when fully loaded. To slow! Attempting to merge with high speed traffic was a nightmare. Weak engine... It pays you back in the fuel economy. No V-6 available. The 4 cylinder seems underpowered. Relatively weak 4-cylinder (compared the the RAV4 V6). The 2.4l 166 hp engine is willing and ready to spool up in an instant without complaint even when approaching the red line. The 5 speed transmission is smooth and very refined. This transmission deserves a more capable engine though. The transmission was lazy and non responsive. The acceleration was weak.